It is important to know how accounting processes work and how each operation is done. The Accounting Flowcharts Solution allows to document and present visually such processes like a receiving process, purchasing process, payment process, etc.ConceptDraw DIAGRAM is a software for drawing flowcharts and it gives the ability to draw flowcharts that accurately represent accounting processes in the organization. Sample 1. 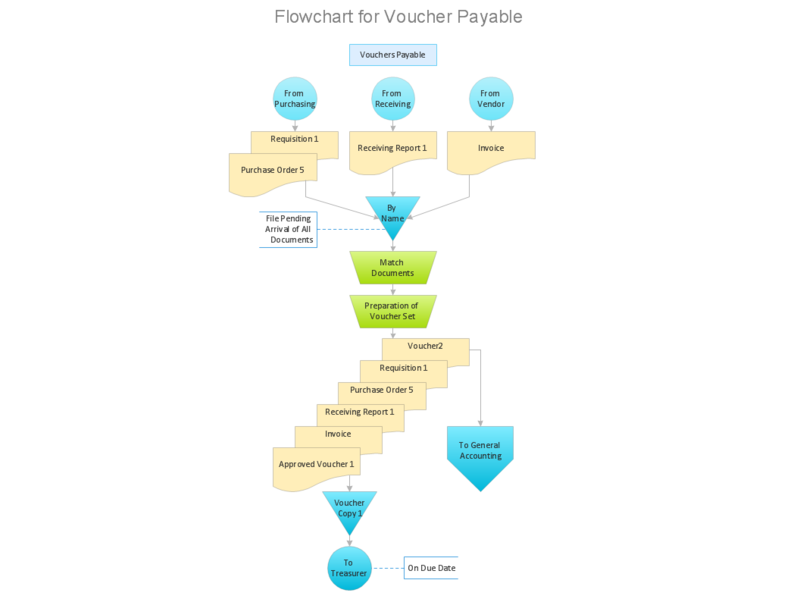 Voucher Payable Flowchart. Accounting Data Flow from the Accounting Flowcharts Solution visually describes the financial accounting process, shows the accumulated information about transactions and events for creating the balance sheet and the final income statement. Accounting Flowcharts Solution contains also a wide variety of templates and samples that you can use as the base for your own Accounting Flowcharts of any complexity.